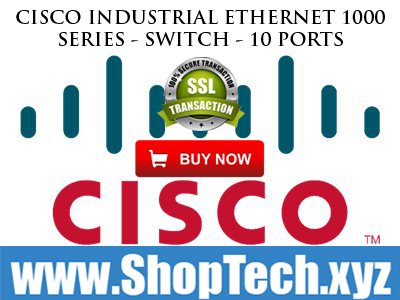 Cisco Industrial Ethernet 1000 Series - Switch - managed - 8 x 10/100/1000 (PoE+) + 2 x 1000Base-X SFP (uplink) - DIN rail mountable - PoE+ - DC power - refurbished. Available at www.ShopTech.xyz (#ShopTechxyz); Featured at RJO Ventures, Inc. The Cisco Industrial Ethernet (IE) 1000 Series Switches are compact rugged switches aimed to operational technology (OT) users with limited IT network knowledge. The IE 1000 Series Switches provide an easy transformation from the legacy factory to digital solution. For machine builders and machine-to-machine (M2M) solutions is an attractive entry level product as a GUI-based, lightly-managed switch. The IE 1000 is a good fit for locations with harsh temperatures and small spaces, and is Power over Ethernet (PoE) capable with and zero IT management. The IE 1000 is ideal for industrial Ethernet applications where small and easy-to-be-managed hardened products are required, including factory automation, intelligent transportation systems, city-surveillance programs, building automations etc. 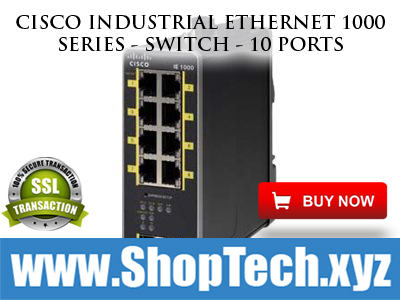 The Cisco IE 1000 Series Switches complement the current industrial Ethernet portfolio of related Cisco industrial switches, such as the Cisco IE 2000, IE 3000, IE 4000 and IE 5000 Series managed Switches. The IE 1000 can be easily installed on your network. Through a user-friendly web device manager, the IE 1000 provides easy out-of-the-box configuration and simplified operational manageability to deliver advanced and secure multiservices over industrial networks.